Hi my name is Lloyd Mabrey. I love writing and singing fun songs!! When I was growing up life wasn’t always so easy, as I was often picked on for being the super skinny kid with glasses. As a teenager I learned how to play guitar and I taught myself no matter what happens in life you will succeed as long as you, ”Choose to Win” “Keep a Positive Winning Attitude” and “Do Your Personal Best!” For the last 30 years I have been living my dream by using music to make others feel good about themselves!! 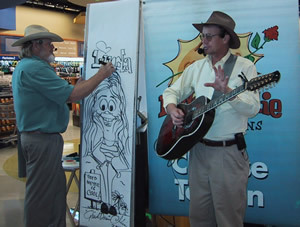 Lloyd Mabrey has been living his dream for over 30 years as an artist/musician. With his happy go lucky demeanor and quick wit Lloyd has been charming audiences since he was a teenager. Lloyd’s dad was in the military and they spent most of his childhood in Europe in the 50’s and 60’s. Lloyd was actually born in Germany at a US Army Hospital and his Mom is from Belgium and France. He got his first guitar from an American soldier who was going back to the States for Eight dollars. In addition the soldier showed him how to play three chords and gave him two picks. Lloyd basically taught himself how to play guitar and because of that he started writing his own songs from the very first day he started strumming because he didn’t know any songs so he made his own up on the spot. This led to Lloyd becoming a master at improvisation which he still uses today singing about people’s lives and things he observes from stage. He is a very, very funny, unique and memorable talent to watch. It is life changing to see the range of emotions Lloyd can evoke from an audience or situation. Growing up Lloyd was this skinny kid who wore glasses that remained optimistic but was a target for bullies and troublemakers. It was his fascination with music that helped him escape and create value for himself in a world that was very judgmental and mean. With the support of great parents and personal perseverance it became part of his life to overcome adversity. By the time Lloyd had reached 10th Grade he had attended 7 different schools. Being the new kid on the block and experiencing the stress of trying to make new friends and fit in has been the blessing that has allowed Lloyd to have empathy for kids today and the struggles they face in today’s world. Lloyd played music for fun in high school making up songs about his friends and life in El Paso, Texas, where his dad retired. He got his first professional job as an entertainer while he was in the Air Force in Phoenix, Arizona in 1975 right before his 4 year enlistment was up. From that point on Lloyd quickly made a name for himself as not only a guitarist and wonderful singer but a great entertainer. Attending Arizona State University for a semester he decided to take some time off and pursue music with the blessing of his parents who are still his biggest fans today. Performing with several bands and touring the country he honed his skills so well that he decided to be a solo artist in 1978. Lloyd played clubs and resorts all over the west and was recruited by Buck Owens in 1983 to come Bakersfield, California where he worked for several years not only with Bucks outfit but with Viking Agency who exposed Lloyds talent to the County Fair circuit where he performs even now nationally. Lloyd moved to Colorado in 1985 where he wanted to raise his family with his two boys Andrew and Chris where they all live still today. Lloyd has six albums and books. Lloyd has always been a wholesome entertainer and because of that, the fairs and other family events were a natural for him. In 1989 Lloyd Met Charlie Gorsuch who recruited him to do motivational speaking and performing for kid’s events and schools. They teamed up and worked together for 5 years as a duo and then started performing as soloist and together when they could mainly because they could reach more kids with their message and be more affordable for schools and sponsors. Lloyd wrote three albums during this time for kids based on respect, responsibility and doing your best. The magic of Lloyd’s presentation using art and music is that he reaches every type of learner that there is which he passes on to teachers so they can connect with their students better. 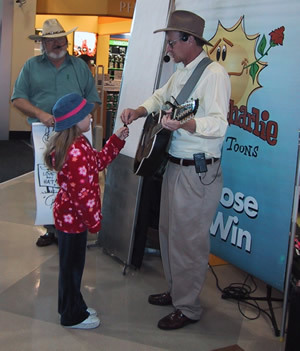 To this day Lloyd continues to perform for children and families and on occasion performs with his friend Charlie whenever possible. They have remained the best of friends even today. In 1995 Lloyd received an amazing phone call to perform at a destination resort ranch in western Colorado. Little did he know that this event would change his life. He performed for a retreat that had names l ike Barbara Walters, Charlie Rose, Oscar De la Renta, Henry Kravis and many others. It was the beginning of many things to come. 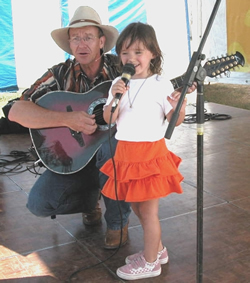 Lloyd’s charm, talent and ability to write songs about people’s experiences at the ranch was well received by the event planners which landed him events all over the country from New York to L.A. entertaining for fortune 500 companies and celebrities from all walks of life. Lloyd has been doing these events since not only earning respect with our nations elite but having a platform where he can find sponsorship for his school program so schools who cannot afford and really need it can. This has also led to a new 14 book series called Traveling Bear (www.Travelingbear.com ) that teaches reading skills with comprehension and character values in English and Spanish. Lloyd continues to have a blessed career and is busier now more than he has ever been. Feel free to contact Lloyd for your event. He is certain to be an asset not only with his talent but the many others that he may able to recommend as well that he works with. To Book Lloyd or buy his music and other products you can find him at www.doyourbest.com and www.LloydMabrey.com.